This week’s behind the scenes post begins as usual with Outlander’s Instagram photos. 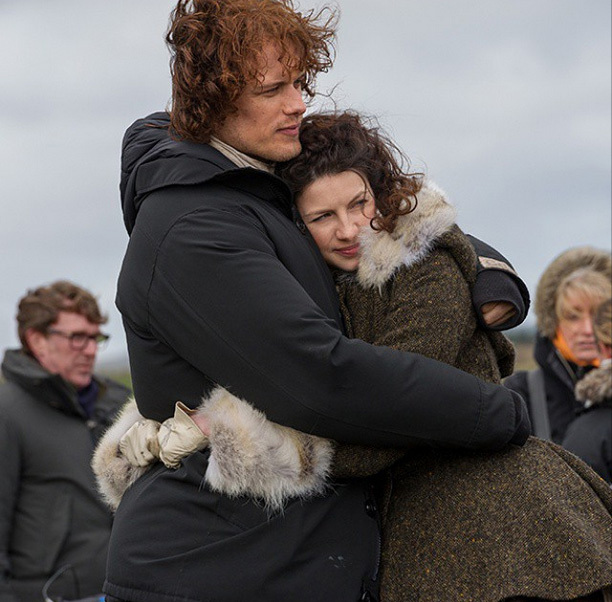 There has only been one photo released in the past week and it features Caitriona Balfe (Claire) and Sam Heughan (Jamie) embracing on set.
.@lpbailey @OutlanderBTS @RonDMoore @Outlander_Starz Settle in folks. No announcements any time soon. #sorry! @brigitte_jean 6 bodices 4 skirts. and then a couple of party frocks. That's all she had. Completely reasonable. @WalkerMrsetw They belong to Sony. They keep them. @heatherharris5 @OutlanderTVNews @OutlanderTO I'm not going anywhere! Too much great stuff to do! This entry was posted in Àdhamh Ó Broin, Aislin McGuckin, Bear McCreary, Caitriona Balfe, Duncan Lacroix, Graham McTavish, Maril Davis, Matt Roberts, Production News, Production Photos, Sam Heughan, Terry Dresbach and tagged Adhamh O Broin, Aislin McGuckin, Bear McCreary, Behind the Scenes Photos, Caitriona Balfe, Duncan Lacroix, Graham McTavish, Maril Davis, Matt Roberts, Sam Heughan, Terry Dresbach by Sarah Ksiazek. Bookmark the permalink.